Red Hot Chili Peppers prove they've still got a sense of humour hiring kawaii metal superstars Babymetal as support for their UK tour. Their mix of super cute J-pop and blistering heavy metal is bizarre on paper, it's even weirder live. The Kami Band all dressed as ghouls discharging searing blast beats and thrash guitars as three school girls dance choreographed cheerleading routines while singing in chirpy Japanese. They even make time for a quick costume change returning to the stage mid-set in fox masks and kimonos. It's a strangely wonderful mish mash of manga goth stylings and crushingly heavy riffs. A joyous contradiction as these two opposing styles collide to create a glorious new hybrid. Ending their set with viral megahit 'Gimmie Chocolate!!' it's utterly adorable and effortlessly charming. After a pedestrian show at this year's T in the Park Red Hot Chili Peppers have a lot to prove. Tonight just feels different. From their customary instrumental intro – that's unmissable RHCP to its core: fat bass, jerky funk and squalling riffs – they are tight as stretched elastic. Anthony Kiedis bounces on stage as 'Can't Stop' judders into life. Flea, a ball of knotted sinew is still one of the most impressive bassists in modern music, fast, flexible with a powerful groove (it's why people like Thom Yorke, Johnny Cash, Patti Smith and Tom Waits have all called on his talent for various projects over the years). Kiedis slyly switching from the alt.rock energy blast of 'Me & My Friends' to their subtler more emotional material such as 'The Zephyr Song' or 'Californication'. 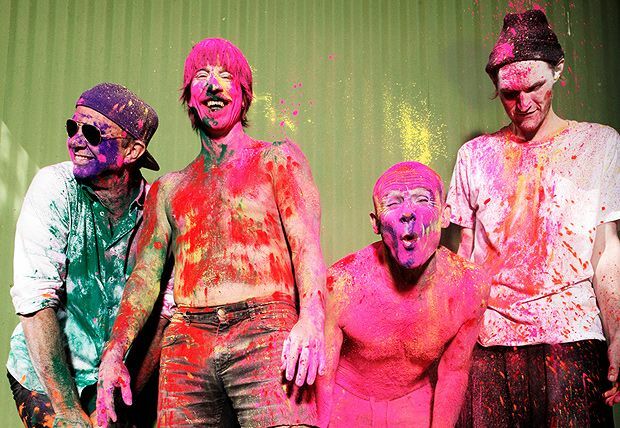 Chad Smith is a beast behind the kit while relative new boy Josh Klinghoffer (who officially joined the band in 2010) has cemented his place in the lineup, tearing up the stage, easily tackling John Frusciante's solos and style while adding his own flourishes and guitar licks. There's an ingenious lighting rig that descends from the ceiling with hundreds of individual lights that move in complex rhythmic patterns suspended above the audience. It creates an immersive experience even in the huge environs of the Hydro. Seen at SSE Hydro, Glasgow, Thu 8 Dec. The efficient veteran LA funk rockers return with their 11th album The Getaway featuring their new(ish) guitarist Josh Klinghoffer. "I became an artist to make your life more difficult"